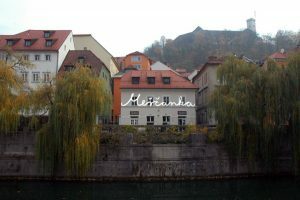 The stylish Mescanka apartments have the perfect location in the old town centre and by the river Ljubljanica. 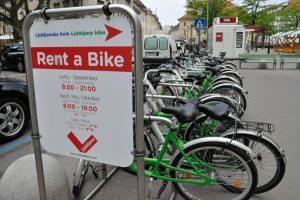 They are set between the two main bridges, a step away from the central Preseren square and three minutes from the city market. Right below the castle hill they are a perfect spot to start discovering city attractions. 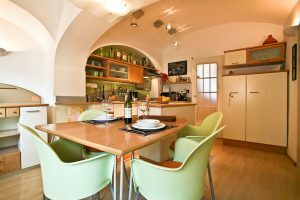 Peaceful, pleasant and clean, the 5 flats and 2 rooms are located in an old house from the 19th century that was completely renovated in 2011. The building overlooks the river, offering great views. All the flats and rooms have their own bathroom with shower, while each flat has a fully equipped kitchen. The flats represent a great mix of renovated traditional furniture with modern practical design. All rooms are air-conditioned with free wi-fi, flat screen cable TV and a cosy couch. You can choose between simple double or twin rooms, a studio apartment, one bedroom apartment or superior one bedroom apartment. Each of the apartments offers the possibility to have two comfortable extra beds. women of Ljubljana from the past, i.e. writers, poets, painters. The building stands in the old town where no traffic is allowed. chatting by the river or just close the windows and enjoy the tranquillity. Whatever part of Ljubljana you choose to visit, your way in and out of the apartment will always bring you closer to discovering the little secrets of the city. Small hidden statues, old facades with interesting details, different colours of the river with different light. The Tivoli park is just 10 minutes of walk away, passing by the Opera house, the Modern and National Gallery. You can walk through the old streets all the way up to the castle or you can use the funicular to get to it. Either way, you will enjoy the views of the city.